Can You Bake a Potato That Already Has an Eye? Can You Over-Bake a Potato? Can You Eat Green Skins on Potatoes? Close-up of a woman's hands holding raw potatoes. 3 Can You Bake a Potato That Already Has an Eye? 4 Can You Over-Bake a Potato? There are brown, red, orange, yellow, gold and purple potatoes available in your local market. Additionally, you might also find a few green hued spuds. You may have eaten a few yourself and you might have heard they are not good for you. The green color is caused by chemical changes in the potato and while anything green is thought to be healthy and natural, a green potato is best avoided. A potato is a tuber that normally grows underground. According to Drs Kuiper-Goodman and P.S. Nawrot of the Bureau of Chemical Safety, exposing a potato to light when it is developing is harmful. When an immature potato is exposed to light, it produces a chemical that makes its skin green. 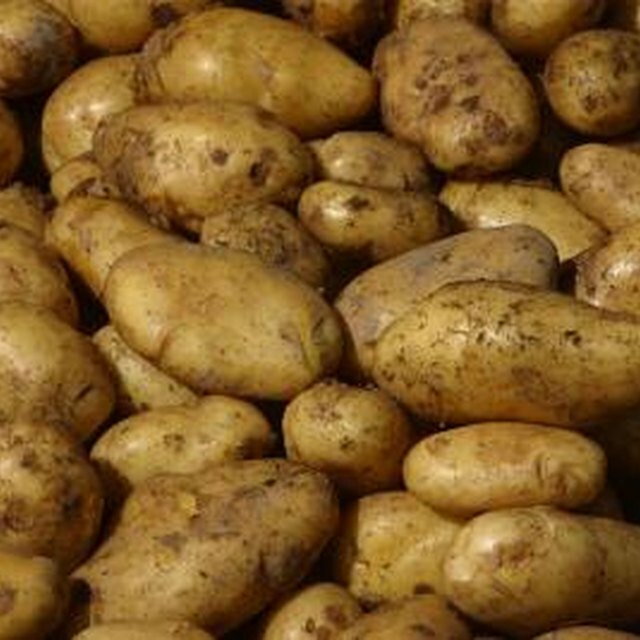 Solainine and chaconimine are two toxic chemicals produced by a potato when it is stressed. The chemicals are its defense against damaging light exposure, insects and disease. Once a potato is exposed to light, its skin turns green due to an accumulation of chlorophyll. You might find that only the skin is green but sometimes the entire potato turns green. The amount of chlorophyll present is directly related to the amount of stress the potato has endured. Solainine and chaconimine help the potato protect itself from insect attack, mishandling during harvest and improper storage conditions. 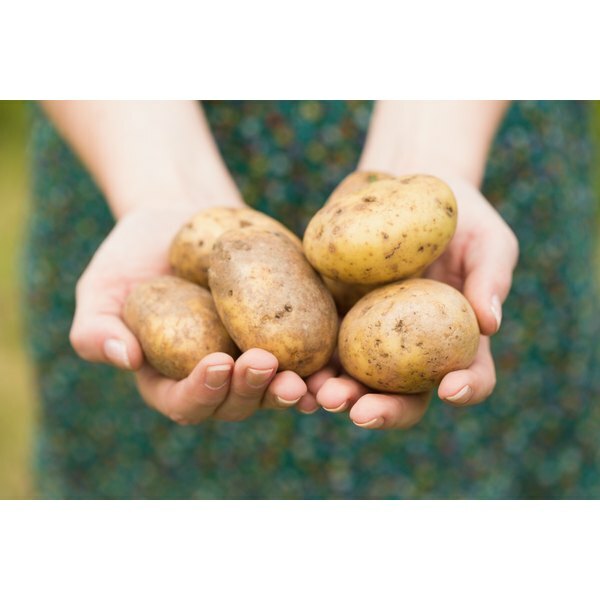 While a small amount of the potato stress chemicals are naturally found in the skin, eating a potato with a higher concentration can make you sick. If your potatoes are green, it indicates that they have been exposed to light which is a significant stressor. Unfortunately, exposing your potato to the many types of cooking and usual preparations, including microwaving will not reduce the toxicity of solainine and chaconimine. Solaine poisoning has been studied and is well documented in medical and clinical literature. When you eat only the flesh of the potato, you are less likely to be exposed to this toxic chemical. Solaine is found in higher concentrations in the potato skin. Because green potato skins indicate a stressed potato, it is best to avoid eating the skin altogether. If the flesh of your potato is also green it is best to discard it. When you are shopping in the market, carefully examine a potato before you buy it and avoid any potatoes with green skin. If you become sick after eating a potato skin and your symptoms include fever, nausea and vomiting, abdominal cramps and diarrhea you may be suffering from solaine poisoning. Your symptoms will probably improve within a few hours, but if they persist call your health care provider. Are Bell Peppers Nightshade Vegetables? Can You Eat Peeled Potatoes After Turning Brown? Does Stainless Steel Jewelry Turn Green? How Long Will Peeled Potatoes Stay Good? Is Eating a Banana With Brown Spots Bad for You?